Start earning flight vouchers with your SA Express flight to Durban - simply email a writeup of your flight to cheapflights@southafrica.to, and we'll send you a flight discount vouchers to reduce the cost of your next flight. SA Express (SAX) operates regular flights to Durban's King Shaka Airport (DUR). Use the flight booking tools on the left to reserve the cheapest flight, and then use SouthAfrica.TO flight discount vouchers to further reduce airfares. 5 August 2013. Inati Ntshanga, the CEO of SA Express, says that the airline may be flying from Maputo to Durban as early as March 2014 (there are already Airlink flights to Durban from Maputo). 2013-07-25. Rating 4/5 : I love flying, I love the view that you get when you're up there in the sky and I love the sinking feeling you get in your tummy when the plane is taking off from the runway, I love chewing gum to stop my ears from blocking, I love the entire experience. Unfortunately, I am not a frequent flyer and as embarrassing as this is, my last flight was in 2008. I had just finished matric, all bright eyed and bushy tailed at this big world that lay ahead of me. In South Africa it is a tradition among the youngsters that you go off for a few weeks to a new town and completely let loose. These weeks of partying and creating memories is known as Matric Rage. My then boyfriend was in Ballito, Durban celebrating with his friends while I stayed home. I had finished a year earlier than I should have meaning that all of my friends were only entering the last year of their high school careers when I had already finished mine. I chose not to go off on Matric Rage because it didn't really feel right to celebrate without them. 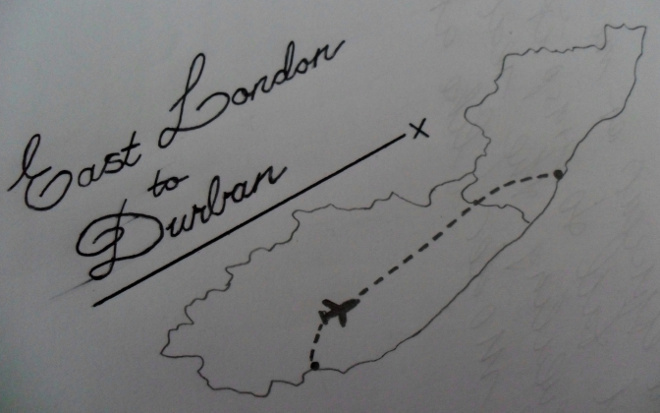 However, on a sunny day as I lay next to the pool with my book in hand and the music soothing my ears, this crazy thought popped into my head, fuelled by missing my then-partner that I should go to Durban, and what faster way than by plane! I followed through with this crazy thought and made the decision the evening before, chatted to my mum and called up my dad to try and get funding for my little adventure, after all what are parents for (kidding mum and dad)!? Luckily my pleas were met with kind eyes and soft hearts, and my dad happened to have a friend with some connections so I was able to get a business class ticket for a discounted price on SAA Express. The East London Airport is a very small one and is unfortunately not on the main 'flying routes'. At the time we did not have much of a variety in terms of airlines and because it was such a spontaneous decision on my part, I never chose the airline because of its cost or what perks you got on the flight. I chose the airline that would get me there faster than I could say 'Take me to Durban' and the one that would be leaving soonest. Thanks SAA Express for coming to my rescue! Of course today our little East London Airport has grown a bit, thanks to the World Cup in 2010 and we are now getting more flights and have more of a variety when choosing an airline. As one would say, variety is the spice of life! I left in the morning the following day with a suitcase too big, eyes too wide, growing butterflies in my tummy and an excitement I couldn't contain. It was my first time flying on my own and I had no idea what to expect. I boarded from East London and found my seat. The plane was a lot smaller than any other plane I had been on before. I managed to secure myself a window seat right behind the wing – I am told this is one of the best seats, with no one else sitting next to me – bliss. I had an entire row to myself to stretch out and truly enjoy my flight, how many people can say they've had that? Not many I'm sure. The plane was virtually empty, with only business men and women flying to or from meetings, or whatever it was that had them catching this early flight. It was a perfect morning with the sky as clear as crystal, inviting me to enjoy the views that lay below me and had my eyes and heart eating it up. I hadn't been to Natal since we had lived there many, many moons ago. It was so wonderful to go back, even if it wasn't to where I used to live. The flight was truly great. I don't have much to compare it to unfortunately, but for me it was just wonderful. It was short and comfortable, the people were friendly but kept to themselves; each of us caught up in our own thoughts and the beauty that lay beneath us. The cabin crew were easy-going and made you felt comfortable without making too much of a fuss and making sure not to bother you too many times. The captain's voice sounded like that of every other pilot. I often wonder if they go for voice-overs before getting the job, or if they go for vocal training to ensure that they all sound as cool, calm and collected as all the other 'drivers of the sky'. Honestly, if having to choose a pilot on his voice alone, I think I would fail terribly. One thing I have realised from travelling and living in different cities is that you could never find people like those in East London and Durban anywhere else, they are of the friendliest bunch, always with a warm smile and a cheerful hello. We were each handed a meal, I remember this because I was so surprised by the contents – bless my innocence! We received a delicious burger, sweets, yoghurt, fruit and a juice. This was absolutely perfect for me because with all the nerves and excitement going on before the flight, I don't remember eating breakfast. We landed in Durban not long after that. I had no idea where to go or how to get out of there, so I followed the crowd and hoped that they would lead me to the pickup area. Obviously you are not allowed to have your phone on during the flight, so I was holding thumbs that my then-boyfriend, let's call him Bob had arrived on time and was waiting for me. Thank goodness he was! We said our hellos and jumped in the car and headed off on the road that would lead us to the beach side cottage that he was staying in. When we finally arrived, I was greeted by a house full of unkempt men, with a house that was even more unkempt – clearly there were no women staying there! The house in general was beautiful and situated in a prime spot. It had a lovely garden that rolled down a cliff and into the beach which was covered by rocks and boulders and met with the crashing waves of the warm Durban Ocean. The week that I was there was spent partying through the nights, dancing until we couldn't 'boogie no more' and generally just losing ourselves in the anonymity you are granted within a new town, with new hotspots to attend every night. Soaking up the hot Durban sun was a daily blessing. The long summer days were what I craved most. Lazing around in the sun, playing volleyball and touch rugby, eyeing out any handsome blokes that strolled past us, dipping into the warmth of the sea, feeling the salt and sand stick to your drying body – there are few things better than a well spent summer's day! We had a ball and the week seemed to go by in the blink of an eye. I never flew back to East London, instead I travelled back down in the car with *Bob, singing the songs that burst through the speakers and taking in the scenery that ran by. It was all such an incredible experience, unfortunately I never took photos of the flight or of my spontaneous holiday mostly because I was too caught up in the experience and also because not even in my wildest dreams did I think I would end up writing about it. The flight was amazing and I'd definitely rate it a 4 out of 5 – nothing is ever perfect so I don't feel it would be fair to mark it 5, but it was pretty darn close! If there is one thing I could recommend to people, it would be to take that brave step and do something spontaneous, jump on a last minute flight and have the holiday of a life time – you will never regret it.